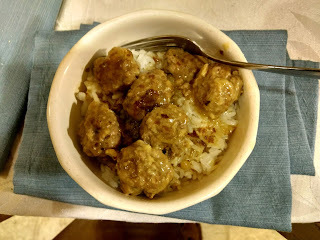 Swedish meatballs - our treat after shoveling so much snow last week. They were delicious! I usually serve them with mashed potatoes but that night it was with rice. Either way, this was a great pick me up after a lot of hard work. We bought only a few things this week in the way of groceries. We had plenty in the house and only needed a few things to round out the menu this week. I'm planning to do a pantry challenge in February and March, so this should be the norm for the next couple of weeks. In addition to our small grocery haul, John won an apple pie at a raffle he entered, so that is being eaten as a snack this week. Yum! No photo again this week. I'm slipping! Or something like that. We have basketball tournaments all weekend, so I ran to the grocery store Friday between other things and picked up a few groceries. I could have bought a little more, but we have overspent what we had planned to spend this month so we stuck with this. A summer meal - I think this was 4th of July, which we also had fruit salad and homemade ice cream for. Occasionally we purchase really good bratwurst for meals like this. YUM! Super Savings Saturday - $37.88 with 2 Beef Roasts! John and I dropped the children and the groceries off at home and went on an honest to goodness date for a short while! It was just an afternoon coffee/tea at a local coffee shop with a gift card but it was wonderful. He had a crazy busy week this last week and this one looks busy too with two funerals and several meetings in the ramp up for the annual congregational meeting next weekend. I'm grateful to have had some time to spend together before the craziness sets in. 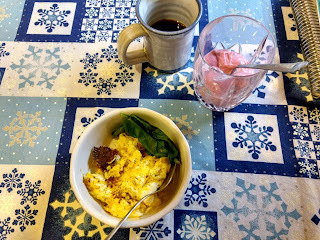 Sometimes breakfast - eggs with spinach, a smoothie (raspberry and banana here), and coffee. YUM! I didn't get a chance to post our shopping trip this weekend so here's what I bought; stopping at the store on the way home on Friday so I didn't have to go out in the icky weekend weather (well below freezing, then snow and blowing, yippie!) unless I wanted to. This is more than I wanted to spend, but we are pretty well set except for milk and maybe some more fruit for the rest of the month now. 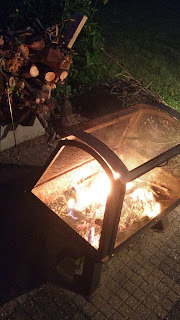 I'm dreaming of summer and warm evening fires, like the one above. We're supposed to get rain and then snow and then cold again through tonight (Wednesday) into Friday. Sigh. I'm ready for winter to be done and it's only the beginning-ish of January. One of the things that people are doing this time of year is posting their "schedule" for their days. And since I often get asked how I "do it all" (trust me, I definitely don't do it all! ), I thought I'd jump on that bandwagon, at least in a way. We have more of a routine than a set schedule, though we do have times to be places and the like. This is our weekday schedule. Yum - Pancakes! 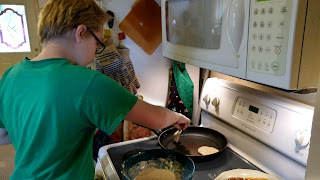 Both of my children can make delicious pancakes and I'm so grateful! One thing they have both asked to do this year is to learn how to cook better and to cook more often. So each week, they will be helping with a meal and we have a few specific recipes that we are planning on working on as well. This week Buddy is helping with Pasta with Veggie-filled Tomato Sauce on Monday and Missy will help with the Crock pot Beef Gravy on Thursday. The photo above is the red velvet cake I made John for his Birthday last year (2017). This year (2018) a friend made a BEAUTIFUL two-layer red velvet cake with cream-cheese frosting. Sadly, I didn't get a photo of it since only three pieces came home (one for me and one for each of the children). The rest was eaten at Bible Study and John had a second piece as an afternoon snack that day before coming home. John and I spent a little more than half our typical monthly grocery budget at Sam's Club stocking up on some things earlier this week, so my goal is to cut back on the grocery budget this week and a few more weeks going forward to even things out a bit. We did end up spending about $10 more today than I wanted to but that just means we have less later on this month. That money was spent to fill a vacancy in our pantry and should last us a while. I keep looking at the photos of my flowers from last summer and reminding myself that our super cold spell WILL eventually pass - a high of +2F (-16.6C) today, and it was -9F (-22.8C) when I left the house this morning. SO glad I own a down parka, lamb's wool hat and warm gloves and boots! Garden planning is on the agenda in January, so I guess the photos are more than just a lovely reminder. One week of 2018 is already done. That is hard to believe! I took this week "off" from work and spent the time "working from home" on both work and school items as well as doing a few things around the house and running a few errands. I did teach Jazzercise and take the children to school but otherwise I stayed home! I enjoyed it very much but now I'm ready to get back to work. That will come Monday! Family: More deliberate time together and being intentional in being in touch with our extended family, including my husband's eight siblings. Finances: To pay off two specific debts that we're starting this year with (something very unusual for us) and to complete a specific list of household repairs. * One evening per week spent as a family. We used to do this regularly, but it's been sporadic for the last year or so and we've all missed it! Time to get back to it! Anyone else scratching their head and wondering where 2017 went? I know, right? I'm actually excited about a "fresh start", so to speak, with the new year. Here's to a wonderful 2018! We spent most of the last week of December out of state, visiting family and doing a lot of absolutely nothing after a very full fall. It was glorious! 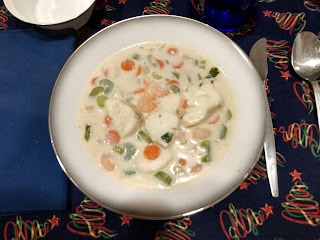 The photo up top is of my Dad's seafood chowder - scallops, shrimp and fish with a bevy of veggies - a Christmas tradition for us. Delicious! I'm a wee bit jealous that Mom and Dad had leftovers for a day or two after we returned home. It was wonderful to visit and we enjoyed "warm" weather. It was well over freezing where they live but much colder than normal for them, which led to us receiving several strange looks when we went to the grocery store in jeans and sweatshirts. The day we left here it was -11F and we returned home to -11F as well (high of +2F today - heat wave!). Brrrr!